This 1,300 megawatt (MW) power plant has two 650 MW generating units and generates electricity from coal and uses petroleum coke (petcoke) as a secondary fuel. 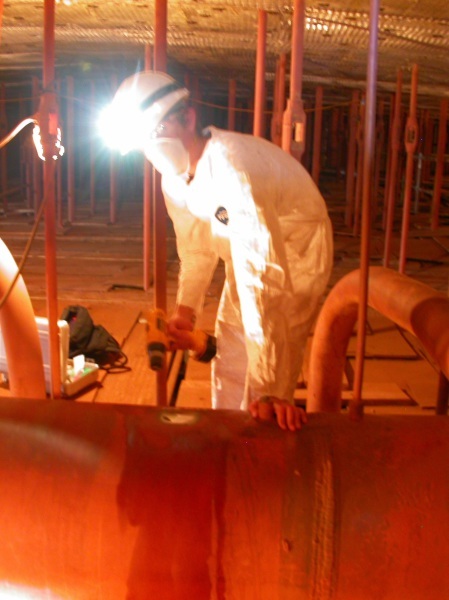 In-situ (on site) metallography was performed on select locations on the north and south spray headers inside one of the power plant's two boilers to check for signs of cracking or overheating and to provide a comparison for future reference. Analysis was performed on two areas of the base metal, an elbow location, and a fillet weld location for each of the spray headers.Sample locations were ground and polished to a one micron finish before being etched with a 4% nitric acid and alcohol solution (Nitol). Replicas of the microstructure were taken using a thin cellulose acetate replicating tape and acetone. The replica samples were then taken to the University of Florida where they were attached to aluminum scanning electron microscope (SEM) mounts using double sided carbon adhesive discs. The samples were then sputter coated with gold and palladium. 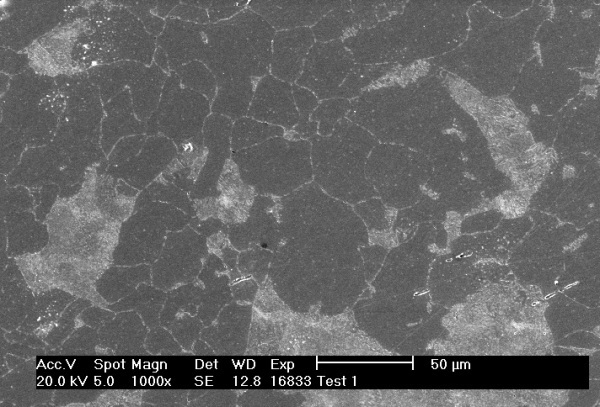 This very thin metallic coating, or sputter coat, allows the microstructure replicas to be viewed and photographed using a SEM. Grain size was determined in accordace with “Methods for Determining the Average Grain Size”, ASTM Methods E112. The steel appears to be relatively fine grained with no obvious signs of overheating or cracking in the areas inspected during this investigation.